If you have never been out first thing in the morning on one of the famous Texas trophy wild turkey hunts you really don't know what you have been missing. 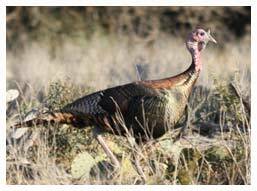 There are two different times for trophy wild turkey hunts and they are in the spring and the fall. 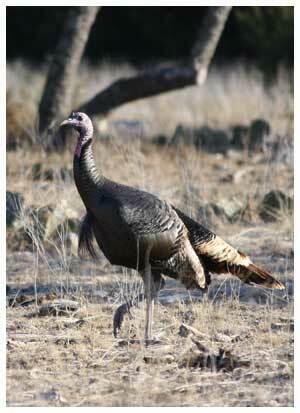 Hunting styles between the two seasons will vary based on the natural behaviors and active of the Rio Grande tom turkeys, which are definitely the prize of the day. For spring hunting calling is used to attract the huge, bronze and buff colored Rio Grande toms. 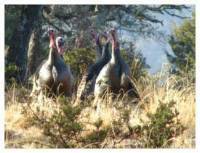 They are actively seeking females at this time so they are more than interested in any new calls that they are hearing around where the female turkeys have established their feeding areas. Hunting guides will get hunters up in the wee hours of the morning so they can be positioned in the feeding areas just as the sun starts to first show over the horizon. The professional guides will then begin the amazing process of calling, literally mimicking the sounds that female turkeys make to bring in and alert the toms to a hen's presence. 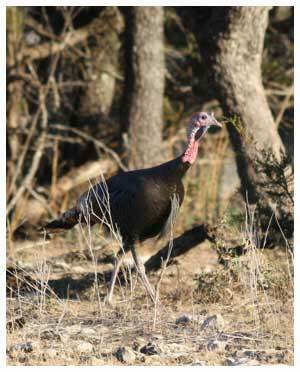 Within a few minutes the strutting, tail displaying toms will start to appear, giving hunters an amazing sight and sound experience on these trophy wild turkey hunts. Typically once the sun is fully up toms won't come into a feeding area and all the turkeys move further back into the brushy areas. The guides can then take the hunters along the known paths and into the shady wooded places where they continue to gobble and call to attract toms to come out of hiding. Hunters on trophy wild turkey hunts may also want to take turns trying to call out the toms, it is definitely an acquired skill! In the fall, trophy wild turkey hunts are more often done from blinds that are set up over feeding areas. Turkey decoys can be used to attract the toms to the blinds and the regular feeding areas also help ensure that hunters have lots of options to shoot a trophy sized bird. Keep in mind that fall hunting for turkeys may pose a bit more of a challenge as these birds have been wily enough to make it through the spring hunt and they are wise to ways of the average hunter. Decoys are often a good idea to get these shotgun cautious toms to come in to target range even if they are responding to your calls. A combination of calling, hunting from a very well concealed blind and having decoys really makes late fall trophy wild turkey hunts a true adventure and a challenge. Rio Grande Turkeys can be mounted for display that really makes a dramatic splash in any trophy room. On top of that they are great additions to the freezer for that special Thanksgiving or Christmas dinner. Think of all the comments you will get when you are able to serve a turkey that you shot for your family dinner.